Richard The Lionheart and his right-hand man, Loxley, are slain in France when returning from the Third Crusade (1199). It’s left to one of their archers, Robin Longstride (Russell Crowe), to return Richard’s crown to London and Loxley’s sword to Nottingham. There, compelled to pose as Loxley, Longstride finds himself embroiled in politics and tackling a French plot that’s abetted by the traitorous Sir Godfrey. It’s been a long time since there’s been a summer release that feels like an event film, and this is it. Darkly shot and Medieval in feel, Director Ridley Scott’s (GLADIATOR) film is a huge production that’s simply fun. It cost $200 million dollars to make and it’s already earned this money back in its release in the states and the UK alone. While Crowe’s accent meanders (though never as bad as Kevin Costner’s, nor is there a mullet in sight), his often-seen scowl is replaced, here, with a twinkle in his eye and a sense of bonhomie. 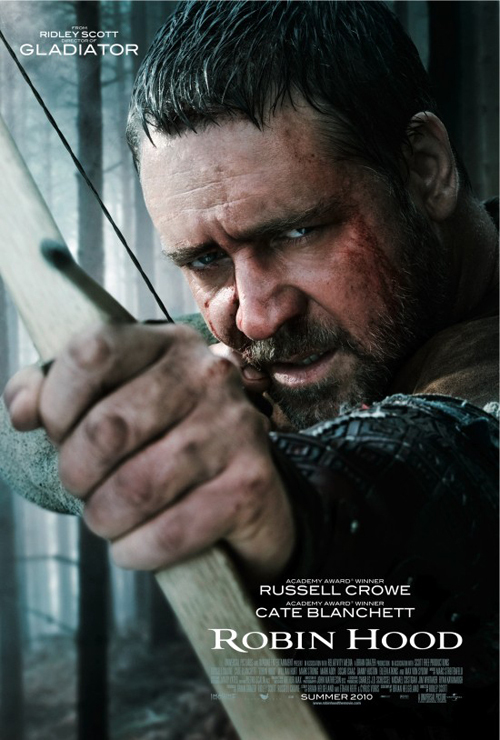 As an aside, Crowe spent four months learning how to shoot a bow and arrow, and can hit a target from 45m.